As we approach the 100th day of the Trump administration, I continue to be deeply troubled by the President's erratic behavior on critical national security issues and his broken promises on jobs and the economy. Together with many of my colleagues, I'm fighting back against his harmful agenda. The thousands of calls, letters, and emails I have received from constituents are an encouraging sign that you're fully engaged in our democracy and making your voices heard. Keep it up! Another bright spot is that the House and Senate passed my legislation to help protect coastal communities from tsunami, and the bill was signed into law recently. Town hall meetings are an important part of my job because they give me an opportunity to hear directly from the people I represent about what matters most. This spring I've held five town hall meetings, and I have one more soon. We've discussed protecting access to affordable health care, supporting public education, and concerns about President Trump's approach to Syria and North Korea. 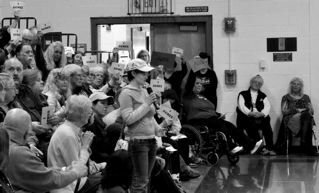 In McMinnville, Hillsboro, Warrenton,Scappoose, and Sherwood, there were about three times as many attendees as in the past, and many people were attending a town hall meeting for the first time. If you haven't been able to attend one of these meetings yet, there's one more this season: at 11 am on Sunday May 7, at the Lincoln High School gym in Portland. I hope to see you there. 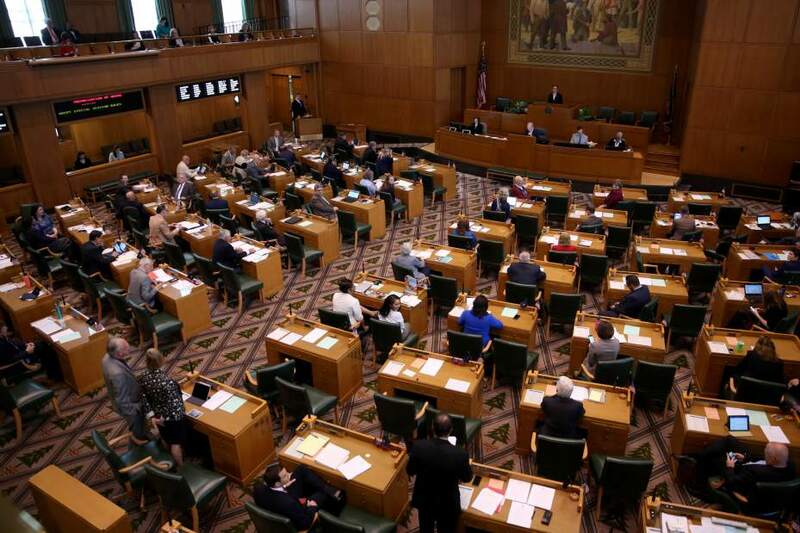 The valuable thoughts and concerns I've heard from Oregonians inform the work I do – so thank you! Science improves our lives every day through weather forecasts, medical research, technological innovations and much more. Oregon is home to a world-class research facility, OSU's Hatfield Marine Science Center, that is studying the ocean and producing valuable research. Visiting Hatfield, I saw many more examples of how federal investment in science reaps benefits for families and communities. I marched at the Science March in Portland last weekend to show support for science and to show opposition to President Trump's proposed budget cuts to research for science, climate, and medicine. I also oppose efforts in Congress to have politicians micromanage scientists and research. As the top Democrat on the Science Committee's Environment Subcommittee, I'll keep fighting for research funding and standing up for science. Everyone should be able to retire with financial security and age with dignity. One of my priorities in Congress is making sure that older Americans have the support and services they need to live healthy, fulfilling, and independent lives. Last year I was proud to take a lead role in helping Congress pass an update to the Older Americans Act. For more than 50 years, programs under the Older Americans Act have delivered nutritional and social services to millions of seniors across the country. Right here in Oregon, the Tualatin Aging Task Force is leading the way on these issues and modelling what engaged citizens can accomplish by working together. I enjoyed meeting with Task Force members to talk about their many contributions to the community and our shared priorities. In April I had the opportunity to talk with owners of large and small businesses about their needs and how they are creating new jobs and growing. Congressman Earl Blumenauer and I held a great discussion with some of Oregon's outdoor retailersabout policies that support a creative, innovative workforce in Oregon. 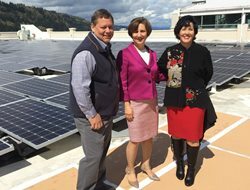 I helped flip the switch on one of Portland's largest solar installations at Montgomery Park, which will produce enoughclean solar energy to power 92 households annually. It was inspiring to hear from the women business owners behind some of Portland's renowned restaurants and to learn more about the challenges they face and opportunities they see as small business owners. On the Education and the Workforce committee, I'll continue to work for policies that increase opportunities for entrepreneurs, support innovative businesses, prepare our workforce, and help grow our economy. But we still have a long way to go to reverse the damage that’s been done. Make sure your Members of Congress know that you’re watching closely, and you expect them fight hard on climate issues. The most effective calls include a personal story about how this issue affects YOU. Do you live in a coastal community or one suffering from dangerous changes in weather patterns? Do you fear for your children’s future? Why? Find yours: http://www.house.gov/representatives/find/ The most effective calls include a personal story about how this issue affects YOU. Are you concerned about environmental refugees? Or the impacts on endangered species? Why? Call, text, and email your friends and family in other states to do the same! “Share” or copy / paste this action! Please consider other organizations you can ask to commit to moving to 100% renewable energy: city government, school boards, your employer, your university, etc. ACTION: URGENT CALLS TO MOCS! URGENT CALLS TO MOCS! TRUMPCARE 2.0 POSSIBLE HOUSE VOTE FRIDAY! --Trumpcare 2.0 keeps the worst Trumpcare components: gutting Medicaid, increasing consumer costs, and using those funds to give billions in tax breaks to the wealthy and health corporations. --The authors know how bad the bill--they included language to EXEMPT THEIR OWN HEALTH COVERAGE from the changes. Our US Representative Earl Blumenauer (District 3) is calling for action today, and we must respond as well. We need calls to support our Oregon MOC’s in this fight, but ESPECIALLY from constituents of Oregon’s lone proponent of Trumpcare: Greg Walden. AND we are adding specific actions you can take today TO PRESSURE THE MODERATE REPBULICANS who will decide the outcome of this vote. SCRIPT FOR EVERYONE BUT WALDEN: “My name is [--] and I’m a constituent from [city], Oregon. I am proud to be part of a state with US Representatives such as Rep [--] who I can count on to vote no on the disastrous amended AHCA which may come to a floor vote as early as Friday, with no debate or CBO score. I am asking the Congressperson to do more than vote NO: I'm asking [her/him] to speak out loudly and publically on this issue, to make [her/his] moderate GOP colleagues understand the devastating effects of this bill on their constituents. SCRIPT FOR GREG WALDEN: “My name is [--] and I’m a constituent from [city], Oregon. I am appalled by Representative Walden’s past support for AHCA repeal and replace plan. I demand that he stand up for us —his constituents whose lives are at stake—and vote NO on the amended bill. The bill may be coming to a house vote as early as Friday, despite no debate or CBO score, which is unacceptable. I'm asking the Congressman to vote NO and to urge his fellow lawmakers to do the same. Thursday April 27th at 5 pm: Lauren Scheiderer, a dynamo experienced Bernie organizer, will host a canvassing and phone bank training. 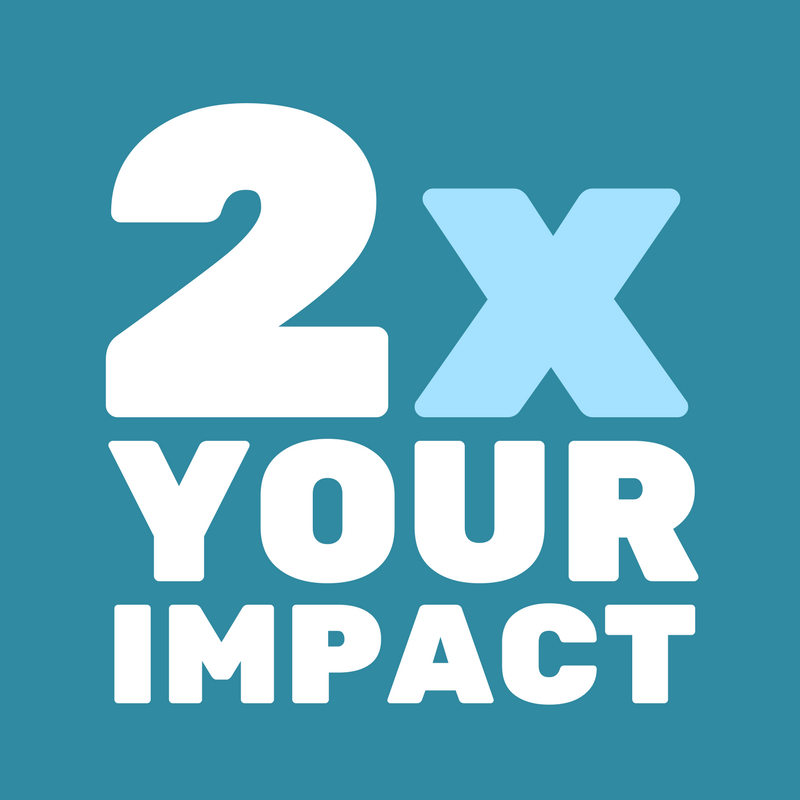 This is rewarding and effective campaign work - with wonderful new tools and techniques. Friday April 28th at 5 pm: The Scorcher is hosting a Postcard Party on Friday at 5 PM. Postcards will be hand written: why is this election important, which candidate or race are you supporting and why, etc? History is full of leaders like Trump, who rise to power by demonizing ethnic groups and “foreign enemies.” They lie freely, round up their “enemies within,” install ONLY loyal friends and family in positions of power, and condemn the press or anyone else who dares criticize. Then, they build up the military and start wars. --Launching missiles, dropping “yuge” bombs, and fake-deploying armadas have no real impact on the misery of millions in the Middle East and North Korea, and pose a grave danger to world stability. --Ceding power to generals endangers a crucial US constitutional principle: elected civilian control of the military. Many Oregon MOC’s have decried Trump’s dangerous militarism; yet most applauded the Syria missile strike, with Peter DeFazio a notable exception http://bit.ly/2pjJkIg. (Others: Wyden http://bit.ly/2q3DKHZ; Merkley http://bit.ly/2oVXbBK; Blumenauer http://bit.ly/2qcRtuX). It is URGENT that we let our MOC’s—red or blue-- know that WE see through Trump’s dangerous game. We want them to have the courage to do the same. The most effective calls include a personal story about how this issue affects YOU. Do you know others who are survivors of ethno-nationalism? Do you fear for your own safety? Why? “My name is [--], a constituent from [city], Oregon. I would like to thank Senator [--] for his opposition to Trump’s war-mongering. However, Trump’s demand that our Senators attend a North Korea briefing today is a ploy to coerce support for increased Defense spending. I’m asking Senator [--] to refuse to be manipulated. I want him to REFUSE to pass a budget resolution with such perilous conditions attached. Also, I want him to speak out NOW to demand Congressional oversight of any further military actions. Consider sharing a personal story about how this issue affects YOU. “My name is [--], a constituent from [city], Oregon. Trump’s demand that our Senators attend a North Korea briefing today—with another planned for the House-- is an obvious ploy to coerce support for huge spending increases for Defense. Representative [--] should refuse to be manipulated. I want [him/her] to refuse to pass a budget with such dangerous conditions attached. Also, I want [her/him] to speak out NOW to demand Congressional oversight of any further military actions. Call, text, and email your friends and family in other states to do the same!. “share” or copy / paste this action! --Most likely: a continuing resolution (CR, see http://bit.ly/2oAjk82). A CR continues current funding levels, but can be a vehicle for policy riders, such as funding attacks on the EPA, the ACA, or sanctuary cities http://bit.ly/2oAjk82 . Trump has also asked for huge “emergency” appropriations--for the wall, deportations, and the military. ---Other options: a hybrid bill combining a CR for some programs and changes in others http://bit.ly/2ozo4uU, or even a short extension to provide another week to negotiate. Any CR will require 60 votes to pass the Senate, giving our MOC’s some power here. Our Senators both serve on the Budget Committee, and have spoken out against Trump’s budget requests, as have several of our US House Reps. Now, they must stand behind their words by allowing no compromises on the budget. Tiffiny Mitchell questions Representative Bonamici about the health insurance industry during the April 15 Town Hall. Tiffiny is a co-leader of the Astoria Community Group. 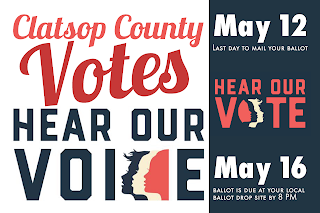 Tuesday, April 25 - Last day to register to vote in Clatsop County’s May 16 election. Positions include commissioners for Port of Astoria, Clatsop Community College, Clatsop Care Health District, and school boards. Register online here. Saturday, April 29 - Save Our Beaches Climate Change Awareness Campaign,3-5 pm, at the turnaround on the Prom in Seaside. hosted by Seaside/Gearhart CG. Check out candidate statements for key positions at Vote the Future. 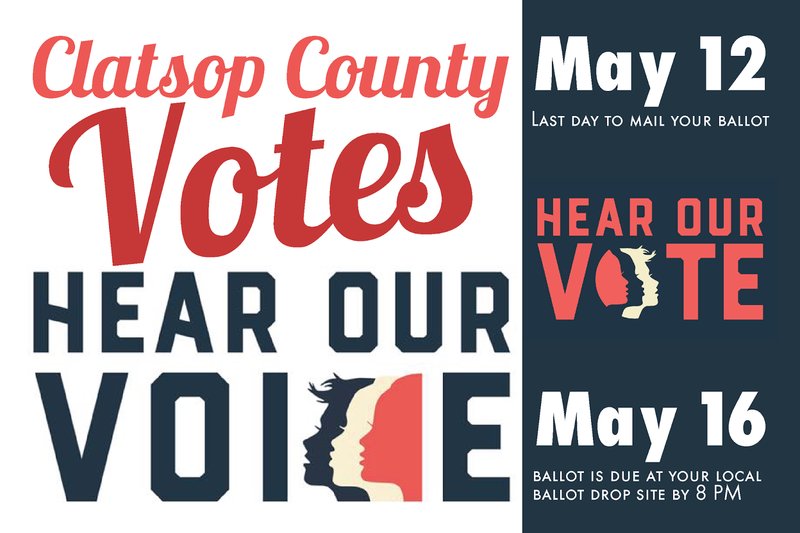 Tuesday, May 16 - Ballots for Clatsop County election due by 8 pm. Postmarks don't count. Thursday, May 18 - ACLU Community Forum, 5:30 pm, at the Performing Arts Center, Astoria; hosted by Pacific Unitarian Universalist Fellowship and INCO. Reservations required to the ACLU: call 503-552-2108, or scroll down to register online here. 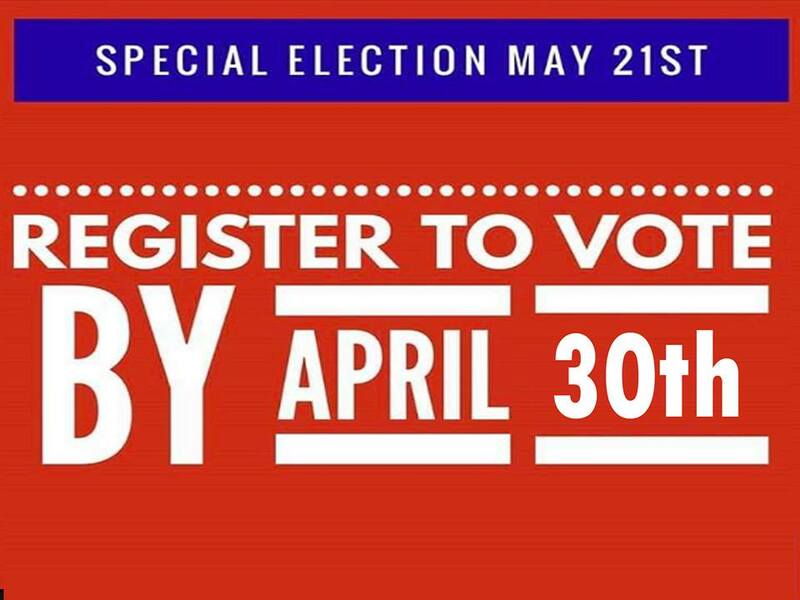 Good candidates need your help in the May 16 election. The Port of Astoria, the college, and the health care district serve all of Clatsop County. 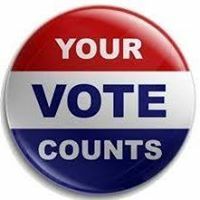 Campaign volunteers are needed to reach voters throughout the county. Lauren Scheiderman and Jacob Van Buskirk are experienced campaign leaders with the skills and tools for effective, enjoyable campaigning. Contact Jacob here or at 253-861-8095. Contact Lauren here to help with campaign for Port of Astoria candidates. Check out VOTE THE FUTURE to learn about local candidates who support INCO's principles. Daily action is easy. Each weekday, we pin suggested actions at the top of the INCO website and Facebook page. New to Facebook? Search for "Indivisible North Coast Oregon" and ask to join our group of 663 and counting. To access handy apps like 5Calls and Daily Action, check the Action Resources sidebar at our website. Pictures change the world. 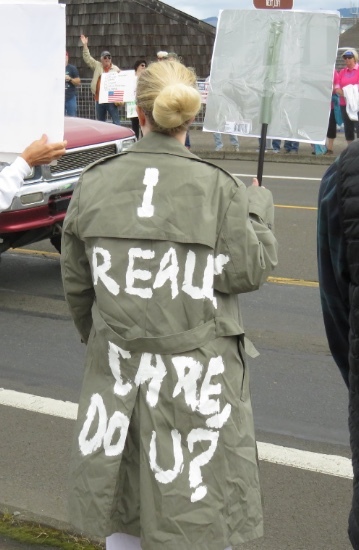 Share your action photos to Indivisible North Coast Oregon on Facebook - in the discussion box that says "write something," click "add photo/video." Interested in an INCO book club? A suggested reading list? Online discussion? In-person meetups? What would you like? Click here before Tuesday, April 25. Kathi Merritt, Meridee Faber, and McLaren Innes are ready for the voter registration drive hosted by the Warrenton Community Group on April 15 at Warrenton High School. Monica Pearson, Sue Zerangue, Carolyn Eady, Carol Newman, Joan Herman, and Renee Rowe led the Earth Day Celebration of Science outside the Astoria Post Office on April 22. Alison Coffinberger, Jackie Nichols, Monica Pearson,, Nancy Montgomery, Sigrid Wood, Silke Ruschmann, and Tiffiny Mitchell handed out “I Agree” and “I Disagree” signs and the new INCO info cards to attendees at Representative Bonamici’s Town Hall on April 15 in Warrenton. The Expand the Base Outcome Team is challenging everyone to bring in 30 people under 30 years old into Indivisible or some other activist/progressive organization. They challenge each person in INCO Astoria to bring someone under 30 to the next meeting. The Cannon Beach and Manzanita Indivisible groups have joined forces. They are planning a new name that is more inclusive (like Indivisible Upper Left Coast - or something - suggestions welcome!) Ann Fontaine puts together a weekly newsletter for the CG. The EPA, Paris agreement, coastal environment and the slashing of funding in the President's budget were the focus of the CG’s table at the April 22 street fair at the 12 Days of Earth Day in Cannon Beach. The CG has been planning their Save Our Beaches Climate Change Awareness Campaign for Climate Day, April 29. Meet at the Turnaround on the Prom at the west end of Broadway in Seaside - 3 - 5 pm. Group members challenged themselves with making at least one call a week and bringing at least one new person to the May 11 meeting. 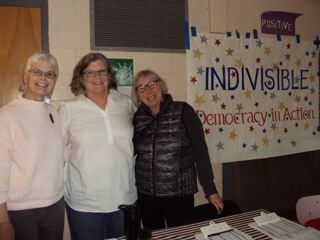 Meridee Faber, Carmen Hammersmith, Kathi Merritt, McLaren Innes, and others were ready for hordes of new voters at the Warrenton voter registration drive at Representative Bonamici’s Town Hall on April 15 at Warrenton High School. They were a colorful and welcoming presence, as was a banner made by Carolyn Vena. Members decided to postpone their planned Immigrant Event. Eighty peninsula and area citizens heard nine speakers express views on important topics like education, law enforcement, budget restraints, immigration, social justice, infrastructure issues and more. Special kudos to Jill, Michele, Carole and Karen for providing supporting documents, props, and a six-foot plywood likeness of Congresswoman Jaime Herrera Beutler. And thanks to Fred Carter for providing pre-program music for the gathering. It was our first effort to assemble concerned citizens in a town-hall format. Perhaps we can create another town hall gathering a few months from now. Create the projects and events you want with your Community Group (CG). Check the INCO Calendar in this email to see current CG activities. Our CGs are in Astoria/East County, Cannon Beach/Manzanita, Seaside/Gearhart, Warrenton, and the Washington Peninsula. 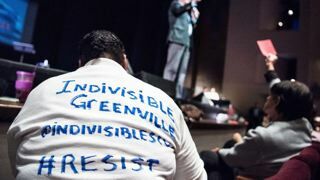 If you’re not yet connected with the Community Group where you live, contact INCO or sign up for one at the Indivisible North Coast Oregon website. We encourage you to use the many resources on our INCO website. Be inspired. Take action. Are your friends wondering how to Resist and Persist? Send them to our blog to find out more about INCO and to sign up with INCO. Everyone has a role to play in defending democracy! Contact Deb and Laurie at incoregon@gmail.com, or find more information on our website and Facebook page. Follow us on Twitter @IndivisibleNCOR. This Thursday, join Indivisible and the National Immigration Law Center on Facebook Live to talk about what you can do to support immigrant families. On Thursday, April 27 at 9 PM ET/6 PM PT, join Indivisible and the National Immigration Law Center (NILC) for a Facebook Live event where we will discuss the upcoming May 1 Rise Up marches in support of immigrant families. Immigration experts will be on hand to answer your questions about Trump’s efforts to tear families apart, sanctuary cities, and how you can support immigrants. RSVP to get a reminder and other streaming options now. Submit all of your questions here or by sending an email to questions@indivisibleguide.com. May 1, Rise Up: The attacks against immigrants and refugees have been nonstop, from the Muslim ban to Trump’s mass deportation force. It’s time we rise up and show our support for the immigrants and refugees who are fighting back. That’s why we’ve teamed up with the Fair Immigration Reform Movement for Rise Up, a nation-wide action for immigrants and allies to stand together and resist. Rise up with us by attending an event near you! Any attack on immigrants is an attack on all of us. Together we can shine a light on the path to freedom and end the cruelty against immigrants and refugees. If you are interested in joining us to promote the Rise Up events across the country on May 1, here’s a digital toolkit to get you started. New Immigration Ally Toolkit: Check out our new Immigrant Ally Toolkit, developed in partnership with the Fair Immigration Reform Movement (FIRM), Local Progress, National Immigration Law Center, Reform Immigration for America, and United We Dream, for more information on the May 1 day of action and how you can work in your communities to rise up, unite, and protect immigrant families. Should INCO host a book club?